If you were looking for a Lilium best suited to Australian conditions, Orienpet Liliums could be the one to choose. These are hybrids between Oriental Lilies and Trumpet Lilies. First bred in America they are known as Orienpet hybrids or ‘OT liliums’. Generally they are much more heat and dry tolerant than many others. They can be quite tall growing, with cultivars such as the wonderful yellow flowering ‘Conca d’ Or’ reaching over 2m in ideal conditions. These are a perfumed lilium coming in a good range of colours. Black beauty is a lilium henryi x speciosum cross, outstanding on 2m stems. Starburst sensation is a wonderful pink flowering variety. As with most lilies, the warmer the climate the more shade. However in most areas of Australia,Oriepet Liliums will require some shade in the afternoon. A few very warm days of 30 – 40 C will knock any Lilium about. However good light is still required, in deep shade they will become lanky and start to reach for the light. A humus rich deep soil is best, plant these bulbs 15cm deep and try not to disturb for the first 2 – 3 years. As clumps develop you will need to divide them to promote strong flowering. You can top dress in winter with some well rotted compost. We like to water regularly (every 2 weeks) with a liquid seaweed fertiliser. If you are thinking of cutting the flowers, remember to leave plenty of foliage so that the bulbs receive sufficient nourishment for the next season. 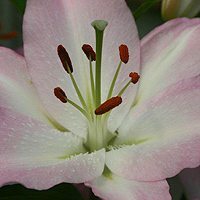 Orienpet Liliums are available for sale from the following growers.